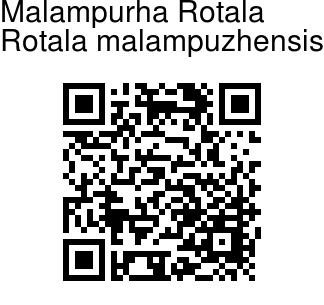 Malampurha Rotala is an amphibious or terrestrial, gregarious annuals herb. Stems are much branched, creeping and rooting below. Leaves are simple, arranged in alternating perpendular pairs, stalkless. Submerged leaves are scale-like to round, upper leaves linear to lanceshaped, up to 15 x 4 mm. Bracts are leaf-like; bracteoles equaling sepal tube, capillary. Flowers are monomorphic, stalkless, solitary. Sepal tube is bell-shaped, bright red, sepals 3, ovate-pointed, appendages 3. Petals are 3, small, bright red. Stamens 3, inserted above the base of the calyx tube. Ovary spherical; stigma head-like. 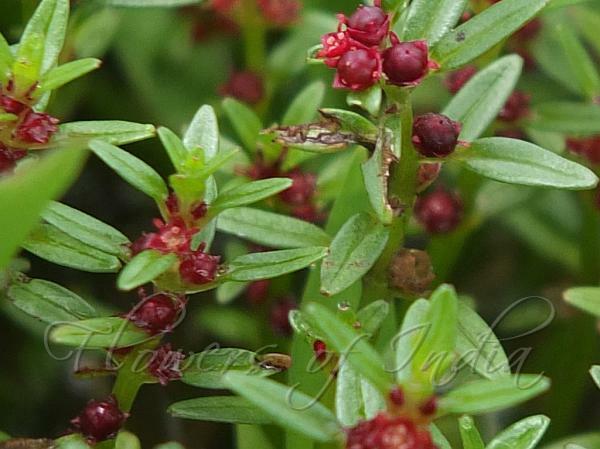 Capsules are spherical, bright red, opening by 3 valves; seeds 10-15, smooth, bright red. It differs from other Rotala species mainly due to tufted habit, small narrow leaves, protruding capsule and sepals, capsules as well as seeds being bright red in colour. Malampurha Rotala is endemic to Southern Western Ghats. Flowering: July-September. Identification credit: Siddarth Machado Photographed in Honnavar, Karnataka.